Renew your Membership for 2019.
please contact the Hon. Secretary/Treasurer by using the "Contact Us" on the main menu as soon as possible. Bantry Redfest ‘An Slua Rua’ 2018 Join us for The Bantry Redfest, a weekend of fun and entertainment celebrating the rarest hair colour in the world. We invite all people of redhead and non-redhead origins to The Bantry Redfest ‘An Slua Rua’. The Westlodge Hotel and Leisure Centre is situated in the market town of Bantry, overlooking the eternally beautiful Bantry Bay on The Wild Atlantic Way. Join us June Bank Holiday weekend 2018 and watch ‘Bantry Go Red’. Red hair is the rarest hair colour in the world, and of the world’s population only 0.6% are blessed with red hair, Irish people more so with 10% of the Irish population freckled and flame haired. Fun-filled weekend of activities and events promoting the joy of being of redhead origins. A strong line-up has been organised with The Kilkenny’s Live on Friday night, with Red Karaoke in Hannie Murphy’s, and Mr.Music for a late night gig. Saturday kicks off with The Red Olympic games, a series of games and team challenges where teams will battle it out to become Olympic champions. An outdoor movie, and Club Rua. We are holding a family fun day on the Sunday, with Bagatelle live. Derek Ryan finishes off the weekend on Monday. The weekend is in partnership with Cork County Council, Fáilte Ireland, Pure Cork, The Irish Cancer Society and Cork’s Redfm. All welcome to a weekend jammed packed with celebrating everything to do with having red hair. Changes to Speed Limits in France. As and from the 1st July 2018 new speed limets will come into force in France. In built up areas 30 km/h will apply. Urban Motorways or Dual Carriageway with central reservation 110 km/h. In rain or other precipitation 100 km/h. Motorways 130 km/h. In rain or other precipitation 110 km/h. In visibility less than 50m the above speeds are reduced to 50 km/h. Remember:- "Ignorance is no defence in law". 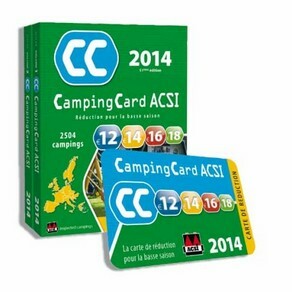 Interested to start camping using Tents or Caravans ??. We have been contacted by Will from "Wonderful Wellies" about their website which is packed with very useful information and tips about Camping. Our younger members might be interested in this as it should help them avoide making the mistakes of beginners. Bill Connell (see Wintering in Spain) has contacted us with the following news. Cork to Santander Spain return direct sailing will commence this year. First sailing will be about mid April. Prices are not yet finalised. This Web site claims to have 9000 monitored camperstops in 27 countries in Europe. It is free to download onto mobile phones and other devices. If you are travelling abroad it might be worth investigation. We have been contacted by a new site which is primarily a luxury “Pod Park” located in Drimoleague, West Cork. It has five to six pitches for motorhomes and space for Tents. Due to its size Caravans are welcome during low season. Booking is advisable. An ideal site for walking tours and as a touring base. It has lots of other facilities. Some views from Mountshannon Lakeside Caravan Park Co Clare. 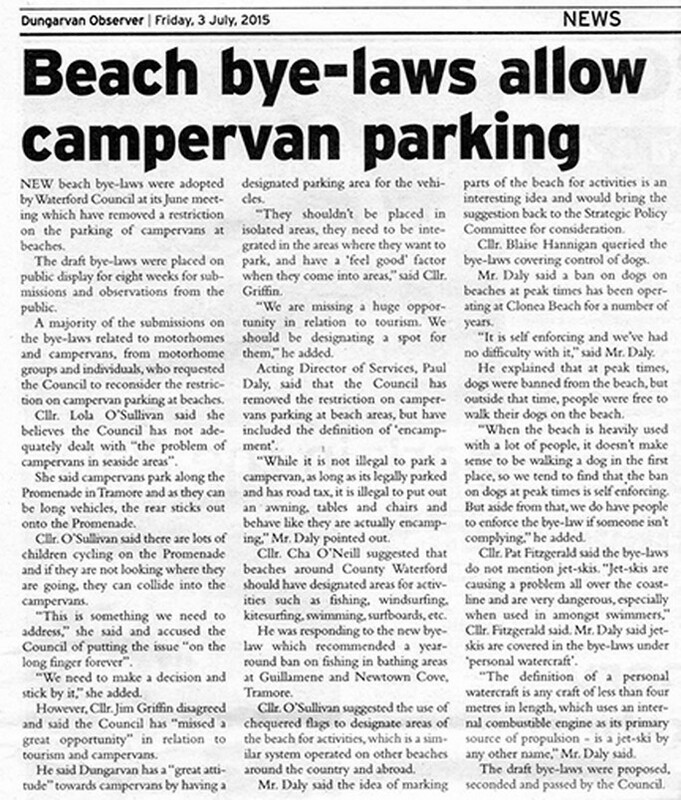 The article below was published in the Dungarvan Observer, dated 3rd July 2015. The copy below is difficult to read but it can be viewed by following the following link and going to page 7. Our committee has again negotiated a discount with Irish Ferries. See members section for details. Had Contact from Gleeson Tyre Products, Ahane, Newport, Co. Tipperary. www.gleesontyreproducts.com . If you are looking for tyres this site is worth looking at. Just got the following link “Derek Walsh Camper Centre” www.camperrepaircentre.com . It is worth looking at this web site. Had contact from Bill Blair of “Power Drive Golf Batteries Ltd.” advising us that they now have a large stock of wet and gel batteries suitable for the Leisure Industry (including Motorhomes), Car, Commercial, Mobility Vehicles, Motorcycles, Security Industry and Garden Ride-on Mowers . You can visit their web site at: www.powerdrivegolfbatteries.com or contact Bill at 086-0768979. Power Drive Golf Batteries Ltd. are located in Abbeyfeale, Co. Limerick. The Club has negotiated some changes to Motorhome Insurance. You can see details of this by logging into the “Members Login” section. If you do not have Internet access, please contact one of the Committee. Having problems with your password to the Members Section ?.